Staining of human peripheral blood granulocytes with Rat anti Human CD66acd (MCA1147G). 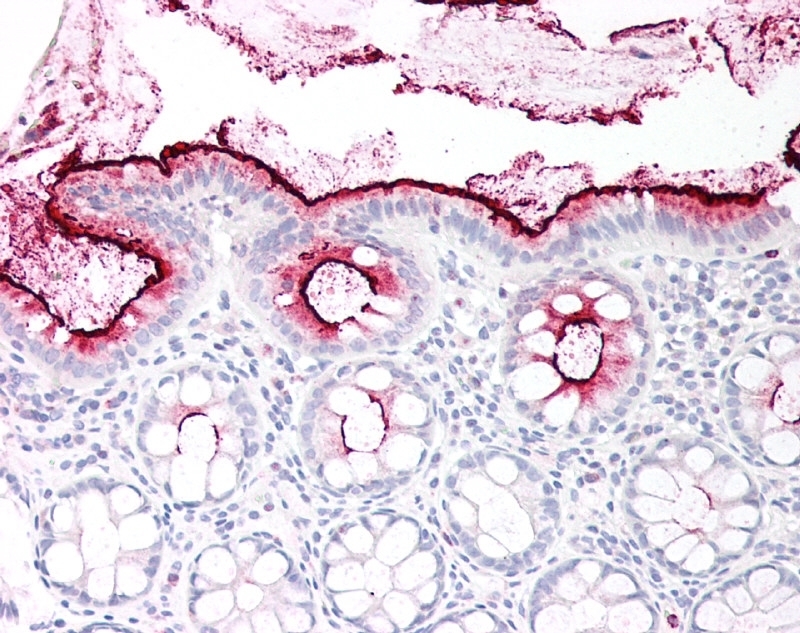 FFPE human colon stained with Rat Anti-Human CD66acd (MCA1147G), biotinylated Anti-Rat IgG and Streptavidin Alkaline Phosphatase (red). Nuclei were counterstained with hematoxylin. 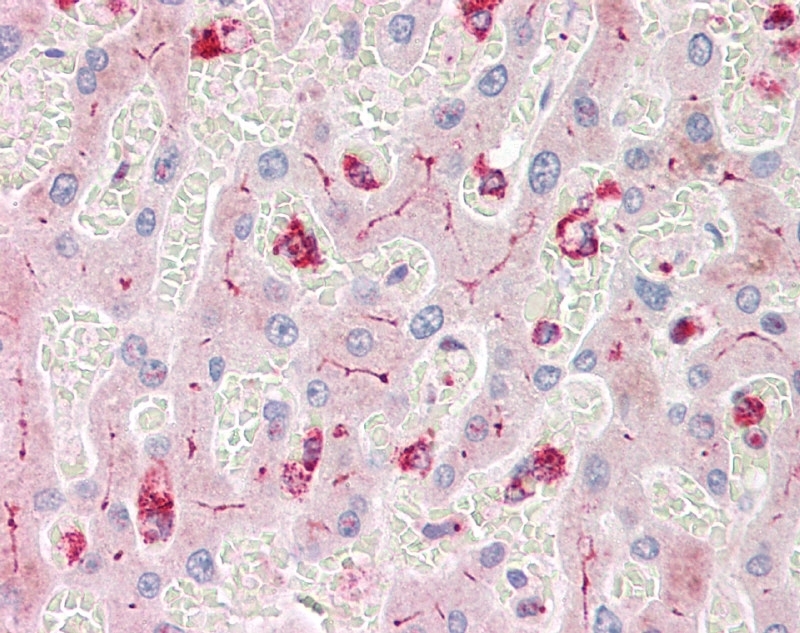 FFPE human liver stained with Rat Anti-Human CD66acd (MCA1147G), biotinylated Anti-Rat IgG and Streptavidin Alkaline Phosphatase (red). Nuclei were counterstained with hematoxylin. Rat anti Human CD66acd antibody, clone YTH71.3 recognizes 3 members of the human CD66 family, namely CD66a, also known as Carcinoembryonic antigen-related cell adhesion molecule 1, Biliary glycoprotein 1 or CEACAM1. Clone YTH71.3 also recognizes CD66c, known as Carcinoembryonic antigen-related cell adhesion molecule 6 or Non-specific crossreacting antigen. In addition the clone also recognizes CD66d which in turn is also known as Carcinoembryonic antigen-related cell adhesion molecule 3 or CGM1 (Watt et al. 1991). CD66 family members are single pass, type 1 membrane glycoproteins bearing a single V-type Ig-like domain and a varying number of C2-type Ig-like domains. Clone YTH71.3 recognizes epitopes in the N-terminal domain of these CD66 family members. CD66 members are expressed by human neutrophils and cells of the colon where it is down regulated in some cases of colon carcinoma (Neumaier et al. 2012). CD66a is also expressed in the human alveolar adenocarcinoma cell line A549 and may play a role in Moraxella catarrhalis induced apoptosis of pulmonary epithlial cells in diseases including COPD and emphysema (N'Guessan et al. 2007). Spleen cells from immunised DA rats were fused with cells of the Y3/Ag1.2.3 myeloma cell line. Where this antibody has not been tested for use in a particular technique this does not necessarily exclude its use in such procedures. It is recommended that the user titrates the antibody for use in his/her own system using appropriate negative/positive controls. Watt, S.M. et al. (1991) CD66 identifies a neutrophil-specific epitope within the haematopoietic system that is expressed by members of the carcinoembryonic family of adhesion molecules. Skubitz, K.M. et al. (1993) In Leucocyte Typing V. White Cell Differentiation Antigen p. 889 - 899 Volume One. Jonker, M. et al. (1989) Reactivity of Mab specific for human CD markers with Rhesus monkey leucocytes. Leucocyte Typing IV p 1058-1063 Oxford University Press, Oxford. N'Guessan, P.D. et al. (2007) The UspA1 protein of Moraxella catarrhalis induces CEACAM-1-dependent apoptosis in alveolar epithelial cells. J Infect Dis. 195: 1651-60. Hill, D.J. and Virji, M. (2003) A novel cell-binding mechanism of Moraxella catarrhalis ubiquitous surface protein UspA: specific targeting of the N-domain of carcinoembryonic antigen-related cell adhesion molecules by UspA1.